Moving leads from prospects to profit center. 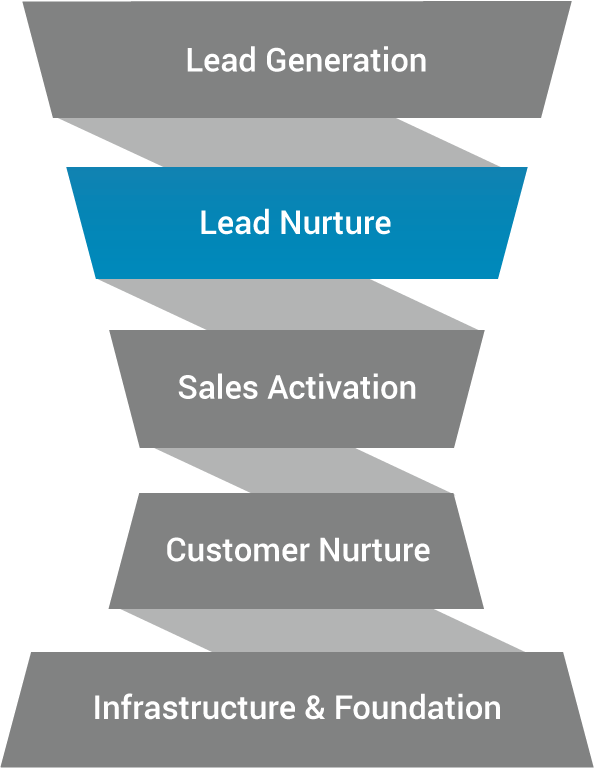 Lead Nurture is a strategy and supporting set of tactics that creates, advances and tracks relationships with leads who aren’t yet ready to buy. This is during the Consideration stage of the buyer’s journey when prospects are searching for a solution they can trust, and a product or service offer that looks like the best fit for their needs. Lead Nurture. Education and persuasion. The most effective companies use lead nurturing to educate and influence people, building on your value proposition, while moving them closer to the sales team. Messaging is personalized, targeted, and relevant. Content should engage and connect with your target prospect and ideally show them how your solution solves their problem and/or provides the desired outcome. Marketing automation. Scalable and effective. Marketing automation technology plays a key role in the Lead Nurture stage. Marketing automation allows marketers to efficiently build, deploy, track and optimize their lead nurturing campaigns while effectively supporting the sales team by routing leads that are ready for sale engagement. Coupled with marketing automation, predictive marketing technology allows you to accurately score and route qualified leads in real-time, at scale, to sales people. The aim is to create a constant flow of qualified leads to feed your sales team and your revenue engine. Properly nurtured and scored leads close at a 33% higher rate than un-nurtured leads. Companies that excel at lead nurturing generate 50% more sales ready leads. Lead Nurture solutions from BIG IDEA. BIG IDEA’s strategy and methodology ensures you have the right combination of technology, content, media channels, and analytics to get your desired ROI and target revenue outcomes. Integrated programs connecting with buyers and driving revenue growth. We create integrated, multi-channel lead nurturing programs that target high-probability prospects based on predictive models made to connect your offer with people who are most likely to close sooner and spend more. We engage your audience with communications that resonate with their needs, wants, and desires focused on driving your revenue growth. Our lead nurturing programs start with a complete understanding of how your unique value proposition and offer meets the needs of your target audience. We produce an integrated strategy and design a program that “hunts” for active demand while “farming” for latent demand. And we bring it all to life with world-class technical and creative execution services. Predictive technology. Unlocking new revenue. To create the maximum positive impact on revenue and ROI, we use predictive technology, data science, analytics, and a flexible, collaborative approach to optimize your program after launch. This allows us to unlock layer after layer of revenue, making it the most effective approach possible. Lead Nurture using a strategic mix of channels and methods.